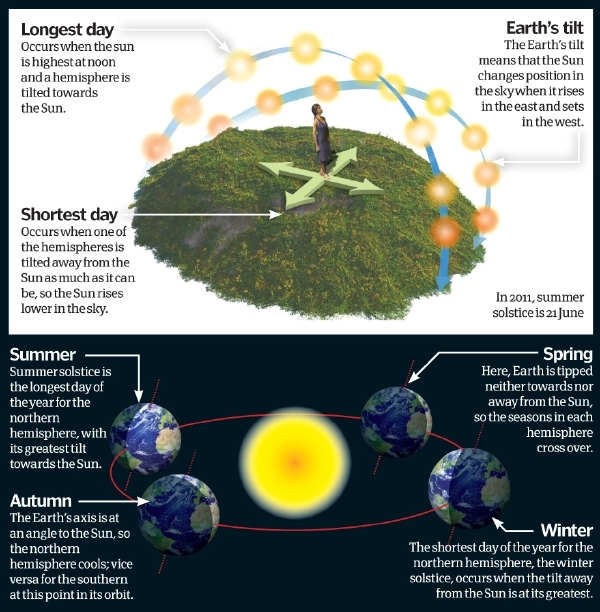 The winter and summer solstices are caused by the orbit of Earth and its angle of orientation as it goes around the Sun. The Earth is tilted on its axis at about 23.44 degrees to the axis of the Sun, so half of the planet receives more light that the other as it orbits. We refer to these two halves as the northern and southern hemispheres. When one is tilted towards the Sun in summer and spring, it will receive more sunlight and ultimately be warmer, but being tilted away in winter and autumn will see temperatures drop.